Our product range includes a wide range of aluminum spiral vane solid rigid centralizer, welded spiral vane solid rigid centralizer (fix), spiral centralizer, aluminum spiral vane solid rigid centralizer (fix) and spiral vane centralizer. We are highly instrumental in offering a wide and superior range of Aluminum Spiral Vane Solid Rigid Centralizers. These aluminum spiral vane solid rigid centralizers offered by us are designed & developed using premium grade raw material, sourced from reliable vendors of the market. In addition to this, the offered range is inspected by our diligent quality personnel, who ensure to maintain its authenticity accordingly. Our packaging personnel ensure to pack as per the diverse requirements of clients. 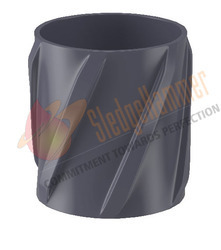 Our customers can avail a wide range of Welded Spiral Vane Solid Rigid Centralizer (Fix). These products offered by us are developed using modern machines and sophisticated technology in adherence with the international quality standards and norms. 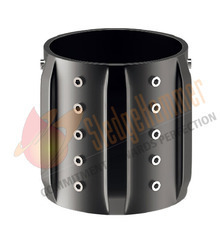 In addition to this, the offered range of welded spiral vane solid rigid centralizer is checked using innovative testing techniques, in order to ensure that only error free products are dispatched at esteemed customers' premises. We are comprehensively offering a wide and an unparalleled range of Thermo Plastic Spiral Centralizers. These thermo plastic spiral centralizers offered by us are widely admired in the market for their usage in different areas such as plastic, electrical, process and food. In addition to this, the offered range is developed using premium grade raw material and innovative techniques in adherence with the international quality norms and standards. To meet the diverse requirements of clients, we are offering a superior range of Aluminum Spiral Vane Solid Rigid Centralizer (Fix). These products are manufactured utilizing optimum grade aluminum, which is procured from trusted vendors of the market. In addition to this, the offered range is widely acknowledged for its reliability, durability, rust proof nature, high performance and superior efficiency. The offered range is packed utilizing high grade material, so as to ensure its safety during the transit. In order to meet the diverse requirements of clients, we are offering a wide range of Aluminum Rotating Spiral Vane Centralizers. These aluminum rotating spiral vane centralizers offered by us are developed using high grade raw material, sourced from the reliable vendors of the market. In addition to this, the offered range is appreciated among the clients, owing to its features such as high efficiency, superior performance and rust proof nature. Looking for Spiral Centralizer ?